The Making Of A Comic – Catbeard the Pirate! 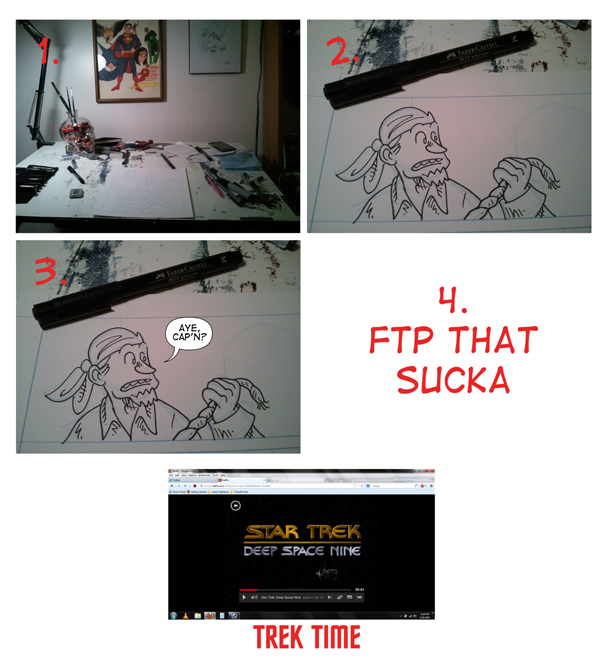 So I thought I’d give you a mini step-by-step of how I do a Catbeard comic as my last behind-the-scenes piece from my vacation. Next week there’s gonna be some special downloadable Catbeard valentines, and then we’re off on more pirate adventure and kitty hilarity! 2. Inking! I ink my pages with Faber-Castell Pitt pens and Copic Multiliners. I usually use a Pitt “M” for things in the foreground, a Pitt “F” for things in the immediate background and small details in the foreground characters, and then Copic .1 and .05 Multiliners for any fine background details that might be necessary. I also like to keep a large supply of Pitt brush pens on hand for inking large areas of black (though sometimes if I’m in a hurry I’ll just fill large areas with Photoshop). I use the Pitt pens and Copics because they’re relatively inexpensive and they’re waterproof. I also like to ink with a brush sometimes (you can see my piratey crystal skull brush holder in the first pic) but when I did my first sketch of Catbeard with a brush, it just didn’t feel right to me somehow. The single-weight pens just somehow felt more like what I was after when I did the very first comic. When I’m inking a page of Catbeard, I usually do the foreground characters first, then tighten up the background details that I want in the image. You can tell that the panel behind Gunny is very rough, and I haven’t drawn in all the greebly bits yet, just a quick outline of where things should go. 4. Really, that’s all there is to it. FTP that sucka. I upload it to my site with the proper naming format for Comicpress and make a post. The rest is automated. But after that I do it all over again! I’m constantly thinking of ideas, doodling new characters and trying to come up with ways to promote and improve upon Catbeard. Hopefully this has been interesting for you! If you have any questions, let me know in the comments, as I’d love to talk more about the process.